We moved my mother out of her home of fifty years in 2003. What followed was a two-year marathon effort to sort all of her precious junk into piles of things to keep, things to give away and things to throw away. We will be forever indebted to our oldest brother, Terry, for volunteering to take on this monumental task. My other two brothers and I would show up on designated weekends to go through things we might want to keep. That, in short, is how I ended up with five boxes of assorted items which included the letters upon which My Darling Dorothy is based. Nothing in any of the five boxes was organized by any stretch of the imagination. As I mentioned in the novel there were multiple greetings cards from the 1940s mixed with greeting cards from the 1990s along with letters, funeral notices, graduation announcements and grocery lists that stretched the entire eight decades of her life. At first, as you might imagine, this was quite frustrating, but then, something happened. I slowly changed my agenda from wanting to organize my mother’s collection to searching for little gems that might exist within the chaos. A sense of real excitement would envelop me when one of those gems emerged. The letters were, by far, the largest gem I uncovered, but the photos I have included with this blog post are examples of other nuggets that appeared as time passed. The insignias were especially intriguing and provided many hours of enjoyment, researching their meaning online. The olive green insignia with the “T” in the middle left no doubt that he was part of the 36th Infantry Division, and the wildcat led me to the 636th Tank Destroyer Batallion. Reading their history further enhanced my understanding of where he was at any given time and what might be going on in his life. Next time I’ll share more photos which were never dated and seldom had any identification. It didn’t matter. They kindled my imagination and led me down many paths which culminated in the creation of My Darling Dorothy. Click below for more information about the division and the battalion associated with the insignias in the photographs. Previous PostReviews vs. Ratings: Be Careful What You Ask ForNext PostJournaling. Healing.Moving On. Jo Virden is the author of A Passion For Life: Ruth Marie Colville. Her first love is writing short stories. 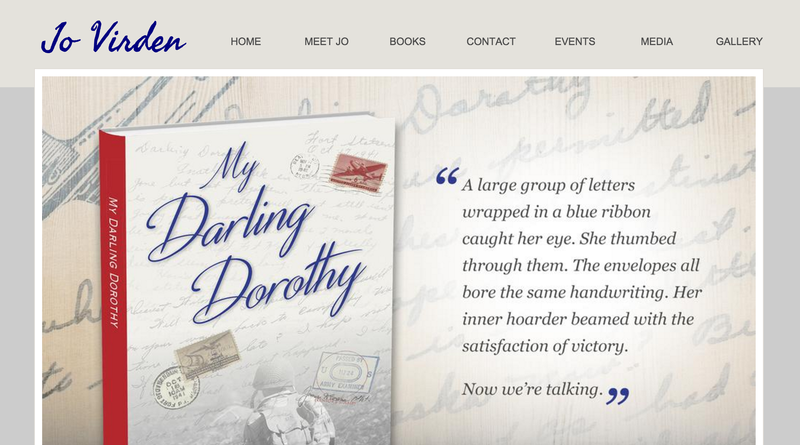 My Darling Dorothy, which began as a simple short story, evolved into her first novel. Jo Ann lives in Arvada, Colorado with her husband, Bill and enjoys outdoor photography, long walks in the Rocky Mountains, and spending time with her family.